We are a construction company specialising in new-build, refurbishment and maintenance contracts in the Retail and Leisure industry. Over 28 years we have built up a reputation for high quality workmanship and professionalism with our Clients. Established in Chester in 1989, we are ideally positioned to serve Cheshire, North Wales, the North West and Midlands. Our aim is, quite simply, to deliver to all our clients an exceptionally high quality service, on time and on budget, irrespective of project value. Behind this philosophy is a belief that we can and should keep things simple and clear by being open and honest in all matters relating to any project, large or small. Our Senior Management Team adopts a professional and practical approach to site activities and is always readily available to our Clients. 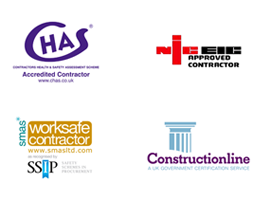 With a diverse range of highly skilled directly employed labour available and a dedicated electrical division, we are able to carry out a full package of works on all types of projects.